Outfit w/shoes [DuLcE] Group Gift free!! The event will take place from April 14-April 29, 2012. ANd all items are on sale for L$50 . I suggest you to have a look at the Flawness sim because all items are there for the FIRST Time. Also, don't forget there are over 50 hunt items hidden on the sim! Look for the little flowers anywhere in a natural area or in a store!!! Items wont for sale anywhere else during the time of the event . The Infinity dress by Emo-tions was inspired in Lord of the rings movie. Here I show the black version. Agnes Finney on Wear Gray Event! Wear Gray for a Day runs from April 6th through to April 22nd. 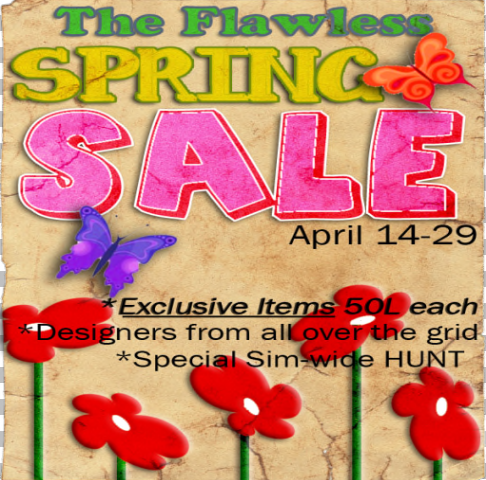 It's a gathering of SL designers from across the grid of all styles and genres, coming together for two weeks of fundraising to raise funds to go towards the American Brain Tumor Association to aide in the awareness, research and in aiding those that suffer from brain tumours/cancer. Dress (w/stockings) 1L from hunt . ::WTGH #11 ::T&G::Touch&GO!:::::. Shoes N-core COQUETTE Platform "Dark Red"
from April 6th through April 15th. They are only hidden at the FIRST/MAIN FLOOR of the Main Store (8 eggs) and in the BOHO HOUSE (2 eggs), across the garden. (NOT on the second floor). Emo-tions & . : Glow Designs :. You should all have one Leather MESH jacket in your wardrobe. Avon Fashion brings you this awesome group gift so hurry and grab it. As well as Casual wear you can make Leather explode buy using your overknee boots. If you dont have one pair yet you will see the adress for a free pair. They are one of the greatest i ever had. Zeery New Bangles And Mesh Dress Free! !